My cousin hosted Thanksgiving this year so my only task was to make dessert. Instead of doing some sort of pie, I wanted to try something different. 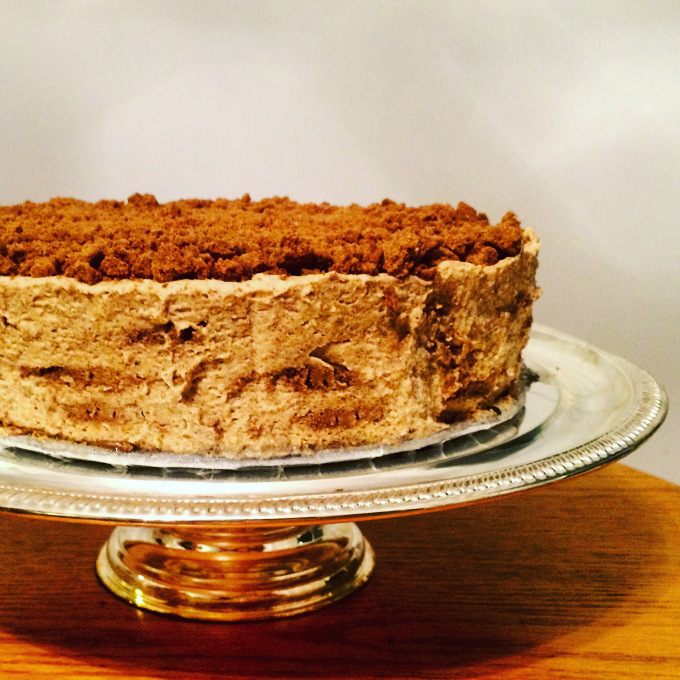 Pumpkin is the preferred flavour for desserts this time of year, so I made an icebox cake. It’s a pumpkin mousse layered between ginger cookies. As it sits in the fridge, the cookies absorb the mousse and soften giving the cookies a cake-like texture. In large bowl combine the cream, sugar, rum, cinnamon, nutmeg, allspice, and vanilla. Mix with an electric mixer on low speed to combine and then slowly raise the speed, and mix until it forms firm peaks. Fold in pumpkin puree with a spatula until incorporated. To assemble the cake, arrange ginger cookies flat in an 8-inch spring form pan, covering the bottom as much as possible. (I break some cookies to fill in the spaces.) Spread one third of the pumpkin mousse evenly over the cookies. Place another layer of cookies on top, lying flat and touching, followed by another third of the mousse. Continue layering cookies and cream until there are 3 layers of each, ending with a layer of cream. Smooth the top, cover with plastic wrap, and refrigerate overnight. To serve, run a butter knife around the outside of the cake and remove the sides of the pan. Sprinkle the top with crumbled ginger cookies.